What do you do when your worst nightmare becomes your life? Just when Tiffany mustered up the courage and strength to walk away from her first long term relationship, and begin a new life as a single mother of two young boys, her life was changed in an instant. One fateful night she found herself face to face with the barrel of a gun and when the trigger was pulled she fell to rock bottom – homeless, heartbroken, and trying to find hope while healing from years of wounds that were now being exposed on the 11 o’clock news. 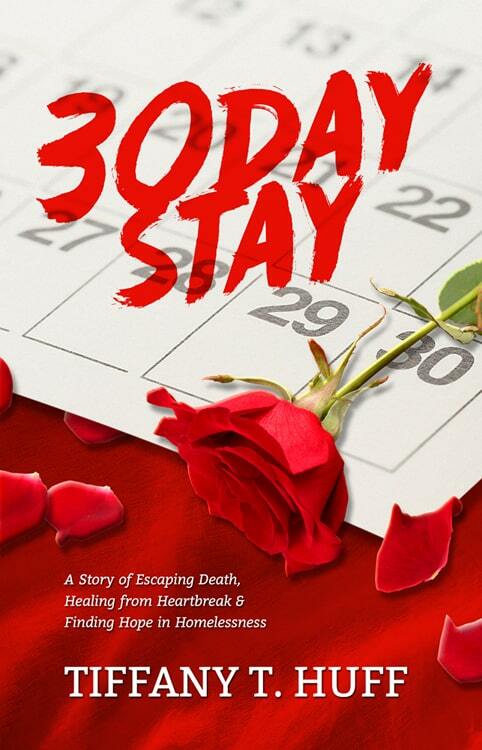 30 Day Stay is a story about one woman, but it is also a story about any of us who find ourselves in situations that require us to reinvent ourselves from the ground up while everyone is watching. This incredibly intimate and breathtaking memoir reveals how the shame associated with societies stigmas and the facades we maintain to appear like we have it together alienate us from our true selves and others, and captures the beautiful truths that are revealed as we courageously commit to reinventing ourselves in spite of it all. This book is so powerful! I appreciate the rawness of this story a reminder that whatever our life’s struggles are that you do not have to remain in that place of hopelessness. The readability of this book is awesome it is as if the author is sitting at a table sharing her story of resilience with a group of women. This is a MUST read. Really an encouraging read. Funny, deep, real and authentic read. I just finished and I had tears of sadness because it happened to Tiffany and tears of joy because she made it through “The War.” She shared in such a way that the emphasis was on overcoming and not just the experience itself. found encouragement and the motivation to press through. This book has touched my heart, lifted my spirit, and opened my eyes all at once. Tiffany thank you for sharing you journey through life with the world!